The mysterious twilight envelops the mysterious muffled melody of the intro, refracted by unknown guitar trends, but then the main motive sticks out of oblivion, anticipating a violent drive led by vocal frenzy breaking fetters and restraining obstacles. In the chorus, the vocals seem to slow down in thoughtful reflections, connecting the contrasting elements in the title track of the Hades Rising - As Frost Takes Over (EP) album. Complementing the whole picture of the musical canvas, Reliquary of Life develops the melody of the previous composition, weaving it in the unrestrained couplet drive, twisting the melodious lace with emotional vocal phrases, trying to escape from the musical captivity of the charming melody, indulging in desperate pleas in the choruses. But marvelous melodies enthrall, in the instrumental part, first enveloping the atmosphere of anxious expectations, then proceeding with pulsating impulses collected in a progressive musical image and completed with an epic fairy-tale saga. Continuing the holistic sound Winter Elegy develops the progressive trends in its introduction, the vocals evoke a rapid drive, hiding in the verse with a cover of marvelous melodic guitar passages, in the bridge, sharp impulses pulsate in a furious march summing up the vocal reflections in the chorus. Soft and gentle in a confused reveries ballad Repined Thoughts completes the album with waves of romance, but the vocals give a touch of majestic meditations, supplemented by a dense pulsating rhythm, yet retaining a marvelous melody and completing a very holistic musical artwork in which each song seems to complement the rest with its own trends and nuances. 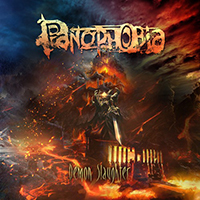 Wind noise, rain, thunder create a background for the entry of the title track, which starts the Panophobia - Demon Slaughter (EP) album with a dense and dark musical fog. Vocals explode with unrestrained rage, the rest of the musical components tend to catch up with the impetuous vocal impulses. The music is supplemented by a dense and severe sounding vocal part, combining growling, harsh and screaming in very interesting variations. In a brief instrumental bridge, bad weather from the introduction returns, but the vocals again sweep away these influences, in the final part the majestic melody comes to the forefront of the musical image. The eastern and folklore motifs introduced into the instrumental bridges develop into the introduction, anticipating the fabulous motifs completing the introduction before the violent drive of the Past Regrets verse. However, the melody of the introduction is retained in the main motive, twisting the alternation of vocal styles, in which a harsh appears, reaching almost to a clean vocal - apparently the vocal delicacies do not know the shores and limitations. Pulling the whirlwinds of darkness and fog into the entry, Rage rolled out a stern battle of musical and vocal frills. But in the chorus epic tales come to the forefront of the musical canvas, glorifying the heroic deeds of the legendary heroes.